As kids, we spend much of our free time drawing or creating some unique works of art (even if no one knows what they are), but as adults, we often let our creativity take a back seat to our many responsibilities. With that thought it mind, it’s time to get crafty with this weekend date idea! 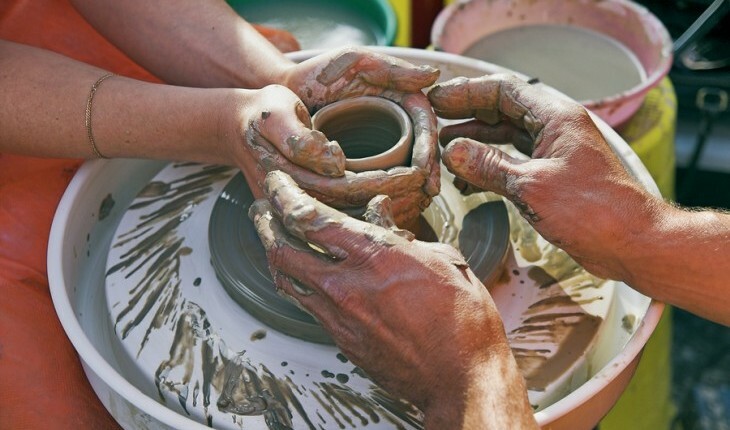 On your next night out, take your honey to the local pottery store where you two lovebirds can create your own clay pieces or paint ones already made. Channel your inner Demi Moore and Patrick Swayze and create your own clay pieces with this relationship advice. Many pottery stores, artists’ studios, and community colleges offer workshops in pottery-making where you can create anything from vases to bowls and plates. If you’re looking for a budget-friendly date idea, Groupon is a great place to locate deals on classes. Maybe your beau has a secret artsy side just waiting to shine! If you two enjoy yourselves, you might consider joining a weekly or monthly pottery class together to really focus on improving your creative abilities. You’ll probably meet other couples too and have the opportunity to expand your social circle. If you can’t find a place to craft your own or just don’t feel up to the challenge — or the mess! — try to find a store like Color Me Mine where you can purchase all sorts of fun pottery pieces and decorate them yourselves. Find that perfect vase to house your next bouquet of wild flowers and see how in sync you are by working on a single project together. In a quiet pottery studio, there will be plenty of time to talk while you work. If you’re a new couple, this is a great opportunity to get to know one another, and if you’ve been together for a while, it’ll give you a chance to reconnect. Painting is also a great activity if you are looking for group weekend date ideas to enjoy with your favorite couple friends. If you are in need of some inspiration, let your partner be your muse. Use their favorite color or shape to guide you. To make things more fun, decide to make something for each other and then swap your handmade gifts at the end of the date. That way, you’ll both have something to help you remember the day. Have you ever gone on a crafty date? Share your story below!